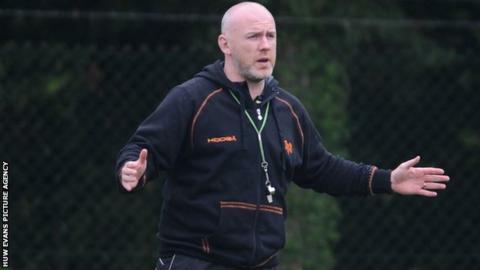 Ospreys coach Steve Tandy says something must be done to stem the player-drain from Welsh rugby. Lock Ian Evans has already signed a three-year deal with Heineken Cup champions Toulon in France and will leave the Ospreys in the summer. Lions duo Alun Wyn Jones and Adam Jones are both out of contract at the Liberty Stadium at the end of this season. "In the current financial climate, it is getting really difficult [to keep players]," said Tandy. On Monday former Ospreys scrum-half Mike Phillips announced he had signed a new two-and-a-half year contract with Racing Metro a month after being sacked by Bayonne. The Welsh Rugby Union has made £1 million available to help keep international players in Wales, but no announcement has been made on how that money will be spent. "We need solutions and there has been a lot bandied around about a million pounds, but when you have a lot of British Lions and you give us £250,000 it doesn't go far between four Lions," added Tandy. "If its a one-off payment and the figures are there and you cannot hide behind them." Evans's decision to sign for a French club follows on from Scarlets centre Jonathan Davies's announcement that he has signed for Clermont Auvergne in France. The four Welsh professional regions have been hit by a series of high-profile departures in the past year. Current British and Irish Lions George North, Jamie Roberts and Dan Lydiate all left the Welsh regions at the end of the 2012-13 season. Tandy admits the loss of Evans, who has played his whole career at the Ospreys, was a blow. "It is something we would have like to have dealt with a little bit better, but some things are uncontrollable," said Tandy. "Something needs to be done about it to keep players. The wages of British Lions are up pretty high when you are not financially blessed any more. "You can't keep spending money that you haven't got. "In the financial climate, we just cannot compete but everybody does expect you to compete to keep players. We don't have the money, so we cannot spend it." Tandy also responded to claims by former Wales centre Tom Shanklin that the ambitions of Welsh regions had to be questioned with so many players leaving. "It is pretty easy sitting in a studio, making comments like that, when you don't know the actual ins and outs of what the regions have got to live by," said Tandy. "It is something we are working on and we are revisiting all the time, but ultimately something has to be done within Welsh rugby." " It is getting a bit ridiculous, it's getting a bit frustrating, but we can only prepare with the hand we are dealt."